Over the years the traditional Play Now/Kick-Off type modes have seen their audience shift to the more expansive modes that offer something in return for the time being committed to playing. If it’s not the Franchise, Story, or Ultimate Team modes then maybe it’s even the Play Now type games that follow along with the real sports seasons. FIFA 19 is offering something brand new for Kick-Off however, and the several unique new ways in which it can be played could make it a destination mode once again. 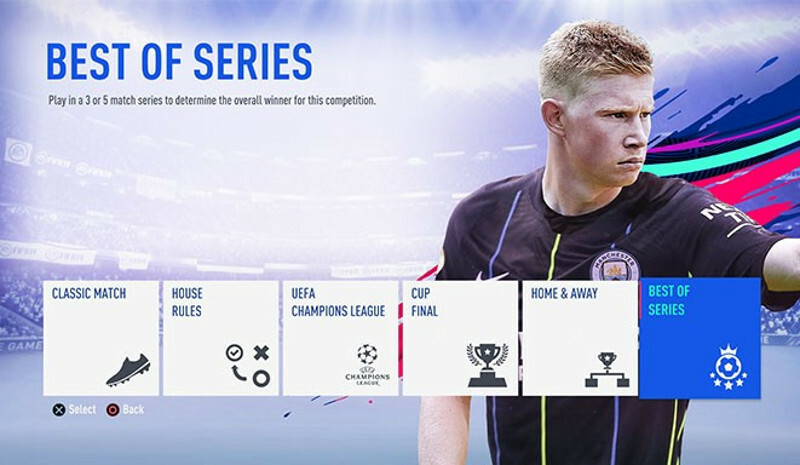 The most prestigious club competition in the world is just as integrated into Kick-Off as it is to the rest of FIFA 19. From group stage matches to the Final, you can set up a custom Champions League match with specific visuals, rules, and more that provide a realistic, immersive tournament experience. If you’ve ever wanted to play a match in FIFA with different rules—or no rules at all—the House Rules match type is just for you. You can set up a match with a selection of custom rules, including No Rules, Survival, Long Range, First to . . ., and Headers & Volleys. Survival Mode: Each time a user scores a goal, a random player from the scoring club is removed (excluding the goalkeeper) to create a challenge for the player with a score advantage. No Rules: Anything goes in this match type, in which there are no offside calls, fouls, or bookings. Long Range: Any goal scored inside the box will count as one goal, but goals scored from outside the box count as two goals. First to. . .: This match type lets you set a custom win condition, whether it’s first to score (golden goal), first to three goals, etc. The match will still play to the clock and go through full time, as well as extra time and penalties, if you choose. Headers & Volleys: You can only score in this match type with a header or a volley. Free kicks and penalties also count, but any other goal scored using your feet outside of a volley will be disallowed. Play classic matches in a three- or five-match series to determine an overall winner. Play your match as one of a handful of real-life cup finals, including the Champions League Final, Europa League Final, FA Cup Final, and others. Official kits, badges, match balls, and authentic broadcast overlays (for a select few tournaments) provide an authentic cup final experience.